"When I'm lost in my art - I'm at home," says Ruben Anton Komangapik, contemporary Inuit artist. It is this ability to spiritually transport himself "home" that characterizes his artistic work. Nowadays he lives far away from his beginnings in Pond Inlet, Nunavut, during the late 1970s. He began to establish his artistic career in 1995 in Iqaluit where he graduated from the Nunavut Arctic College Jewellery and Metalwork Program. Right from the beginning of his career, Komangapik's artistic works were innovative, unique and surprising. His work is not the typical tourist item most people associate Inuit art with - dancing polar bear and inukshuk. Some of his works are startling and very intricate. Many of his works lead the eye on a journey of discovery, taking the mind on a tour of an Inuit legend or a shamanistic ritual. While Komangapik often produces artwork based on his perception of his grandfather Joshua's stories, songs and legends, he translates them for his contemporary audience. He is very much an Inuit male living in this century who has found a place in his life for his Inuit traditions. During the late 1990s, Komangapik was just like any other modern young Inuk. He admired heavy metal music bands such as Metallica and Black Sabbath. He and some friends formed the heavy metal band Slayvz. Komangapik played the bass. Their songs were in Inuktitut and English, the languages that Inuit youth could understand. Slayvz entertained Inuit youth at many public gigs and were very popular. They even cut a CD and made a few video clips. Meanwhile, Komangapik also performed drum-dancing and traditional singing to local audiences at other events. Komangapik has been a role model for Inuit youth since then and continues to inspire them with his successes. Komangapik left Nunavut in 2007 to make his home with his wife, Estelle Marcoux-Komangapik in Montreal. There, he did his artwork on the balcony of the couple's apartment, even during the famously cold Montreal winter. Estelle made a running record of her husband's work, often photographing his pieces very late at night or very early in the morning, sometimes in freezing weather. The couple still lives in Quebec, but moved out of the city in 2009. Much of Komangapik's artwork lyrically expresses of his grandfather Joshua's teachings and stories. His art goes beyond the traditional Inuit carving and sculpting techniques that the old man had used. Komangapik often combines Inuit traditional materials with precious metals and gemstones. He witnessed how his grandfather made tools, knives and 'ulus' (women's knives), combining new materials brought to him by outsiders. The combination of traditional Inuit materials, such as bone, antler, ivory and sinew, with imported steel, copper, and wood demonstrated the old man's ability to think imaginatively about materials and passed this resourcefulness on to his grandson. 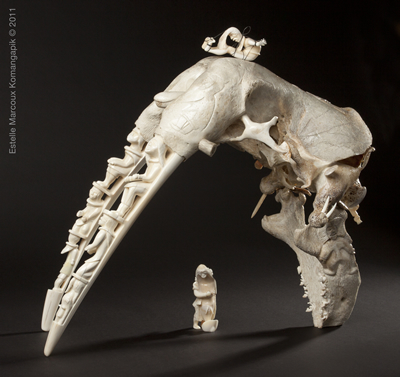 Using modern tools and methods, Komangapik combines materials in often very surprising ways to present his artwork, for instance, smooth cool silver against rough porous whalebone or smooth milky ivory against menacing curved claws. Ruben Anton Komangapik's artwork sings with Inuit spirituality. Often he depicts Inuit shamanistic themes that other Inuit artists have avoided in the past. He attempts to show that Inuit shamanism is not the 'Satanistic dark arts' that Christian religion has portrayed it to be as the enemy of Christianity, but what it truly is - the traditional Inuit nature religion. Komangapik's grandfather had no problems being a Christian as well as practising the healing arts of Inuit shamanism. His grandfather not only showed that old and new materials and techniques can be combined, he also demonstrated that old and new beliefs and practices could also be blended to serve Inuit living in the modern world. Komangapik pays homage to his grandfather's vision throughout his artistic endeavours. His works portray his love for nature, his exploration of the meaning of life and the place of Inuit within nature. This is important to Komangapik because his traditional role as Inuit hunter supporting his family by catching food animals on the arctic ice and waters is curtailed by his current environment and mode of life. He sees the act of making art as modern day hunting. By his life and work he demonstrates that he can be truly Inuit wherever he may live, for he carries his identity in his heart. Ruben has the ability to express his thoughts and beliefs without words in a way that captures those who view his artwork. Komangapik's work inspired his wife, Estelle, to begin the project meant originally as a birthday gift. 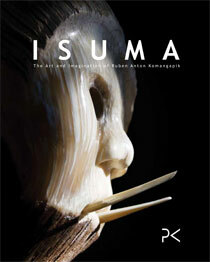 This project grew from a simple idea to a formally published book, Isuma: The Art and Imagination of Ruben Anton Komangapik. Estelle planned to give her husband a sample book of photographs of his then recent sculptures and carvings. She asked her mother-in-law, Dorothee Komangapik, the artist's mother, to write the book's text while her friend, Geneviève Larocque, designed the book. Lillian-Ulayuk Komangapik, Komangapik's sister, did the book's Inuit syllabic titles. Everyone worked quietly in secret to give Komangapik this loving tribute for his birthday gift. It was truly a family effort orchestrated by his wife, Estelle. The official book was launched at the Feheley Fine Arts gallery, Toronto, Ontario,Canada on September 24, 2011. There, before a small crowd, Komangapik spoke about how his art is based on his grandfather Joshua Komangapik's teachings. He also performed drum-dancing and sang some of his grandfather's songs. On show at this event was Ruben's sculpture Shamanistic Ritual, which is featured on the cover of the Summer edition of the IAQ Inuit Art Quarterly magazine. Komangapik's ornate reversible silver and claw goblet called S.I.N.S (Shamanism Is Not Satanism), as well as other recent works, were featured in the IAQ magazine. Isuma: The Art and Imagination of Ruben Anton Komangapik is a loving and fitting tribute to Komangapik's artistry and hard work as well as a tangible token of love of a wife for her husband. It is also the means to spread the images of Komangapik's works for those in far away places who are unable to see his artwork in museums and art galleries. The hope is that it inspires Inuit youth to make art in the future. Part autobiography, part art object, this book will introduce the readers to one of the Arctic's most talented young artists. With it's aerial design, arresting photography and texts covering Inuit legends, culture and the artist's life, this book will delight any serious Inuit art lover as well as the non-initiated ones. Ruben Anton Komangapik will be holding a book signing on Saturday, November 19, 2011, at the Canadian Guild of Crafts, in Montreal, during the opening of the collective art show intitled "Contemporary Reflections Metal/Paper/Stone". The opening starts at 2pm.